Never pay more than you expect! No hidden fees... No suprises. We show you the total price up-front, before we start the work! Don't wait any longer for a repair! We arrive in fully stocked vehicles, ready to access and fix your electrical issue the same day! We arrive at your doorstep fully prepared! Service when YOU need it! No waiting around, wondering where the technician might be! Your time is valuable to us. We understand that this repair is happening on YOUR time and you've got better things to do than wait on a repair technician. We guarantee your satisfaction with our work! We proudly back up our work with our 100% Satisfaction Guarantee! We can repair and install anything electric in your home or office. All our technicians are licensed by the State of Oregon and are highly skilled and trained. 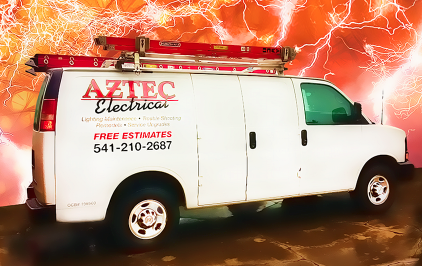 With our expert knowledge and superb customer service, you'll call Aztec Electrical your Favorite Medford Electrician and Rogue Valley Electrician!